Girl Scouts from Western Pennsylvania got an extra treat from some fellow Scouts from Wheeling, WV, when they came to the Challenger Learning Center to take part in the Return to the Moon mission. 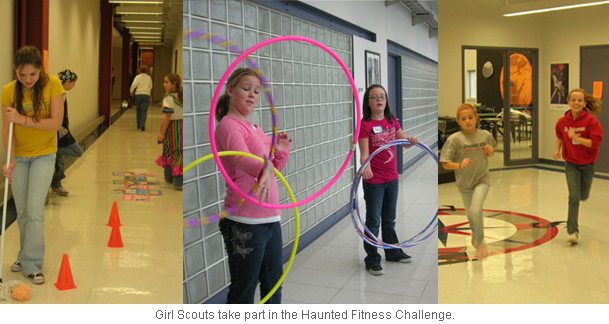 The Wheeling Girl Scouts, members of Black Diamond Council Troop 4920 (Organized Chaos), facilitated a Haunted Fitness Challenge Nov. 9 for the girls from Troops 661 and 881 of St. Alphonsus School in Wexford. The Halloween-themed event had been postponed from an earlier date. After joining the troops from Pennsylvania for the Challenger mission, Organized Chaos split up to work as monitors at various fitness stations, assisted by parents and Challenger flight directors. The challenges included ball tosses, jumping rope, hopping, sprinting, and even hula-hooping. The cool down "Dead Man's Walk" was made more interesting by the girls doing their best acting jobs. All participants left with a "Death Certificate," which is actually a 12-week fitness log. The fitness challenge was written by the Organized Chaos troop and is posted on the Ohio Valley Runners and Walkers Club website.